Explanation: Landing on Mars in January, NASA's twin rovers Spirit and Opportunity have now each spent over 330 sols roving the martian surface. Still healthy and well in to extended missions, the golfcart sized robots have operated five times longer than planned. Ranging across the floor of Gusev crater, the Spirit rover has reached the Columbia Hills and journeyed nearly four kilometers. Half a planet away, Opportunity has spent much of its tour on Meridiani Planum exploring the 130 meter wide Endurance Crater. 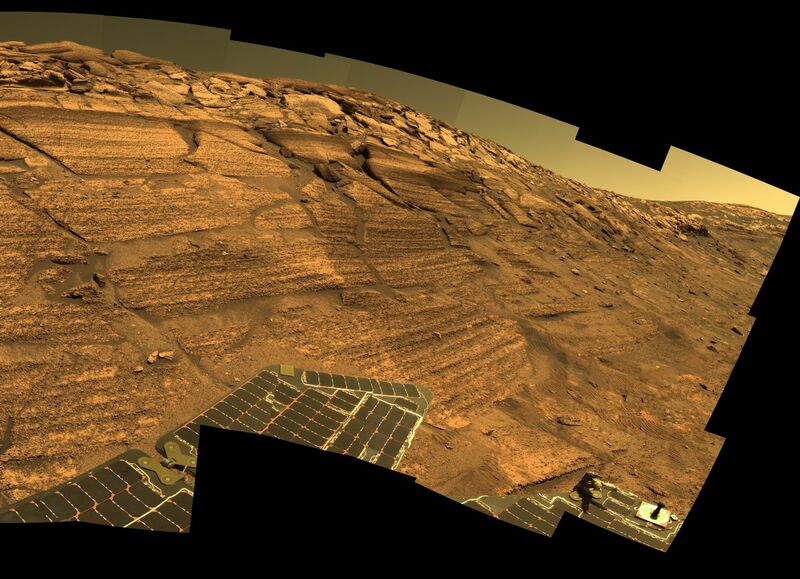 Opportunity recently returned this panoramic view of rock outcrops and steep crater walls. Both rovers have uncovered strong evidence that ancient salty oceans left their mark on the alluring Red Planet.